April is National Poetry Month, and what better way to celebrate than to start each day with a poem? Select poems from any of the books available in the Wellfleet Public Library Children’s Room – and commit to our Poetry for Breakfast Program: one poem a day, with breakfast, all thirty days of April, Poetry Month! And listen to or watch or read or take a peek at the e-resources of children's and teen poetry and the poetry book list below. hosted by poet Billy Collins and found at the Library of Congress. My Favorite is #133 The Summer Day by Mary Oliver. Watch the Reading Rockets Interview. 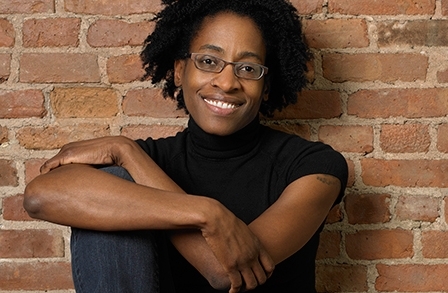 The Poetry Foundation is honored that Jacqueline Woodson is the Young People’s Poet Laureate. Awarded every two years, the $25,000 laureate title is given to a living writer in recognition of a career devoted to writing exceptional poetry for young readers. The laureate advises the Poetry Foundation on matters relating to young people’s literature and may engage in a a variety of projects to help instill a lifelong love of poetry among the nation’s developing readers. This laureateship aims to promote poetry to children and their families, teachers, and librarians over the course of its two-year tenure." Check out her books in the children's and teen departments, especially Locomotion and her recent memoir Brown Girl Dreaming. Click on the cover for more information, or to reserve a copy in CLAMS. Brown, Skila; illus. Bob Kolar. Slickety Quick: Poems About Sharks. Somerville, MA: Candlewick Press, 2016. Sharks! From Great Whites to Carpet Sharks to Frilled Sharks to a kind of shark called Cookie-Cutter Sharks. Very cool. Each poem is matched by facts about each kind of shark (did you know, for example, that Great Whites are the only shark that can lift their heads out of water?). The illustrations are digital renditions of angular blues and greens (and pink for Goblin Sharks) that match the, er - trepidation shall we call it? – that we humans often have for all things shark-related. Rhyme and learn, rhyme and learn. Bryan, Ashley. Freedom Over Me. NY: Atheneum Books for Young Readers, 2016. Three-time Coretta Scott King Award winner Bryan brings us poems about the lives of eleven real slaves owned and sold from the Fairchild Plantation in the 1820’s. John was given as a birthday gift to the owner’s wife when he was eight years old and then she sold him for one hundred dollars, along with everyone and everything else, when her husband died and John was just sixteen. Bryan imagines the hopes and dreams and inner lives of the eleven slaves, creating histories and personalities that give humanity to people recorded in history only as auction items bought and sold. His pen ink and watercolors with collaged photographic reproductions of historical deeds add color and gravitas and import – slaves they might have been, but they were also men and women. And children. Everyone deserves a story, and Bryan comes through. Dickinson, Emily; illus. Christine Davenier; ed. Susan Snively. Emily Dickinson. Poetry for Kids series. Lake Forest, CA: MoonDance Press, Quarto Publishing Group, 2016. After the picture perfect I’m Nobody! Who Are You? Poems of Emily Dickinson for Young People (illus. Rex Schneider; intro. Richard B. Sewall, Owings Mills, MD: Stemmer House, 1978) there seemed no need for another Dickinson collection for children, but Davenier and Snively prove that, in fact, there can never be enough, when done well. Many of the poems are the same, but the ink and watercolor illustrations give new mischief and fun. Here’s an idea – read the Sewall and the Snively. Why not? Fogliano, Julie; illus. Julie Morstad. When Green Becomes Tomatoes: Poems for All Seasons. NY: A Neal Porter Book, Roaring Brook Press, 2016. Poems that move through the seasons, slowly, one by one, savoring each moment. “You can taste the sunshine/ and the buzzing/ and the breeze/ while eating berries off the bush/ on berry hands/ and berry knees.” Morstad’s illustrations are of her signature gouache and pencil crayon, each color and figure deliberate, yet blended into the meaning of one poem, and the scenario of the next. Wonderful. Frost, Helen; photo. Rick Leider. Among a Thousand Fireflies. Somerville, MA: Candlewick Press, 2016. Frost and Leider team up again (Sweep Up the Sun, 2015 & Step Gently Out, 2012), this time to tell the story poem of two fireflies meeting in the night, each line of action deftly photographed. Flashes help fireflies find their mates, and they flash back and forth, back and forth, a rhythmic Morse code of meeting until the last line and photograph find them together. Lovely. Kaneko, Misuzu; illus. Toshikado Hajiri; narr. David Jacobson; trans. and ed. Sally Ito & Michiko Tsuboi. Are You an Echo? The Lost Poetry of Misuzu Kaneko. Seattle, WA: Chin Pusic Press, 2016. Misuzu Kaneko was a poet from a fishing village in western Japan. She was born in 1903 and died twenty-six years later. Her poems of love and empathy for nature and the world around her more than endure – they remain among the most popular verses in Japan, taught in elementary schools across the country and even translated into many languages. Finally, we have an English version. The poems are full of dear and kind affections: waves are children “laughing and holding hands,” fish are pitied (as what did they ever do to anyone but swim and mind their own business? ), and dirt is “where the nameless grasses find a home.” A short biography is included and the illustrations are warm and clear. Highly recommended. Orgill, Roxane; illus. Franics Vallejo. Jazz Day: The Making of a Famous Photograph. Somerville, MA: Candlewick Press, 2016. In 1958, Esquire magazine commissioned a photo shoot of all the jazz musicians they could find, set in Harlem. Each poem in Jazz Day tells the story, of the photographer, the musicians, of getting all the musicians together, of Harlem, of jazz itself. The acrylic and pastel drawings are alive, providing a sense of place and character. In “At the Window” a girl leans out the window and watches the musicians gather, the colors of their portraits fading as they stand farther and farther away from her line of sight. In “She’s Here: Maxine Sullivan, singer,” the portraits of the men surrounding and missing and appreciating the retired singer are full and large, all focused on the shorter but brightly colored woman. Biographies and bibliographies provided – a wonderful book to pore over, maybe take to the record store, too. Raczka, Bob. Wet Cement: A Mix of Concrete Poems. NY: Roaring Brook Press, 2016. Concrete poems – poems in which words are arranged in the shape of the thing being talked about – are always fun, and Raczka is an expert in matters of play (see his 2011 Lemonade and Other Poems Squeezed from a Single Word in which each poem uses only the letters from a single word, all having to do with lemonade). In Wet Cement he messes about with words and shapes in black and white. Icicles hang from the top of the page and lightning is jagged bright across a dark, dark night. Read together and then write your own. Singer, Marilyn; illus. Josée Masse. Echo Echo: Reverso Poems about the Greek Myths. NY: Dial Books for Young Readers, 2016. Singer loves her reverso poems, which is awfully good luck for us, as she does them so very, very well. She invented the form, after all. Each paired poem is the same, but when read up versus down (in reverse) the meaning changes. After all, doesn’t everyone deserve to have his or her side of the story told? It’s all about perspective. Masse’s illustrations match the change in meaning and tone – look to Perseus and Medusa for a particularly strong example. Who is the chosen one, man to cure the world of monsters, or monsters to cure the world of man? You decide. Burgess, Matthew; illus. Kris Di Giacomo. Enormous Smallness: A Story of E.E. Cummings. NY: Enchanted Lion Books, 2015. There was once was a boy named Edward Estlin Cummings. And he didn’t waste time waiting until he grew up to be a poet, oh no. He started when he was very, very small. We know, because his mom kept excellent records. And when he did grow up, he kept writing, and writing, and writing, messing about with shape and form and lower-case letters and upper-case letters, doing what he did for love and language and meaning and joy. “in Just-spring,” he wrote, “when the world is mudlicious… when the world is puddle-wonderful.” Di Giacomo’s mixed media illustrations are a perfect accompaniment to Cummings’ words that splash up, down, and all around, every so carefully and wondrously all his life, from farm to city and war and back again. Excellent biographical detail and with a chronology, too. True perfection. Hill, Laban Carrick; illus. Theodore Taylor III. When the Beat Was Born: DJ Kool Herc and the Creation of Hip Hop. NY: Roaring Brook Press, 2013. There’s all kinds of rhythm, all kinds of rhyme. DJ Kool Herc started as a boy named Clive who couldn’t keep still when sound bumped and thumped. He knew he wanted to – had to – write words to match. And if he couldn’t do it, he’d mix the music and find people who could. Welcome to hip-hop. The illustrations are more like animation than any kind of line drawing, and provide what reads like a cartoon documentary, fun for the whole family. Chronology and bibliography included for further reading and listening. Here’s to he who rocked the block. Nelson, Marilyn; illus. Hadley Hooper. How I Discovered Poetry. NY: Dial, Penguin Group, 2014. Nelson, award-winning writer of the heroic crown of sonnets A Wreath for Emmet Till (illus. Philip Tardy, Boston: Houghton Mifflin, 2005), here writes in unrhymed sonnets about what it was like to grow up as a traveling Air Force officer’s kid in the 1950’s, as an African American girl going through racism and Civil Rights, puberty and first crushes, traveling and wanting to stay still, caring and laughing. “I could spend hours searching the mirror for clues to my truer identity,” she writes, “if someone didn’t pound the bathroom door.” Worth every sonnet. Woodson, Jacqueline. Brown Girl Dreaming. NY: Nancy Paulsen Books, Penguin Group, 2014. Though it’s won every award imaginable, it’s still worth insisting upon. The elegant wordsmith Woodson shares another novel in verse – this time a memoir of her life from the South to her dear NYC - as poignant as her Locomotion (NY: GP Putnam’s Sons, 2003; about a boy and his sister split in separate foster care) and as concentrated and compassionate as a life well- examined and well-loved can be. A must read. Dickinson, Emily; illus. Rex Shneider. I’m Nobody! Who Are You? Poems of Emily Dickinson for Young People. Owlings Mills, MD: 1978. Richard B. Sewall provides the introduction, with the pertinent reminder that “something happens in every one of them [poems], and the interesting thing is to find out what.” Many of the poems focus on the natural world; all are accessible – from pensive description to the bird who “bit an angleworm in halves/and ate the fellow, raw.” An excellent introduction to Dickinson. Ages: 7+. Elliot, David; illus. Becca Stadtlander. On the Wing. Somerville, MA: Candlewick Press, 2014. Subdued gouache illustrations punctured by splashes of bright color well match quick poems of birds. Try “The Cardinal,” as an example. The page is filled with un-burst shades of green, showing just the mute beginnings of Spring – even the birches are more grey than white. But the male cardinal himself – he’s all about the bright red, with his lady in brown by his side. The poem reads, “He’s a hotshot valentine. She’s a Plain Jane. But one without the other… a song with no refrain.” Perfect for bedtime or bird watching. Gerber, Carole; illus. Eugene Yelchin. Seeds, Bees, Butterflies, and More! Poems for Two Voices. NY: Henry Holt and Co., 2013. Poems for two voices offer a personal view of the plant and insect world, from a root feeling blue for getting no attention (“You’re hidden,” his friend says, “It’s true.”) to a friendship song between a bumble bee and a honey bee (“Bumble, you’re a perfect bee.” “Thanks, Honey, so are you.”), the poems offer a fun and rhythmic take on the connections in the natural world. Ages: 4+. Greenfield, Elois; illus. Leo and Diane Dillon. Honey, I Love and Other Love Poems. NY: Harper Collins, 1978. Greenfield’s rhythm is pure sugar; hear the title poem: “I love/I love a lot of things, a whole lot of things/Like/My cousin comes to visit and you know he’s from the South/‘Cause every word he says just kind of slides out of his mouth…” The sweet exuberance of the text is shared with the dignity and joy of classic Dillon illustrations. Ages: 7+. Kennedy, X.J. and Dorothy M. Kennedy, eds. ; illus. Jane Dyer. Talking Like the Rain: A First Book of Poems. Boston: Little, Brown and Company, 1992. Poets include John Ciardi, Ogden Nash, Edward Lear, Christina Rossetti, Gwendolyn Brooks, and Myra Cohn Livingston. The tenor changes, the quality, never. Mora, Pat; Illus. Meilo So. Water Rolls, Water Rises / El ague rueda, el agua sube. NY: Children’s Book Press, Lee & Low Books, Inc., 2014. Poems about water, in English and Spanish, side by side on top of mixed media illustrations. Swish go the poems and swish goes the brushstrokes of the art. Each poem relates to water somewhere in the world and each gets its’ own color scheme to match the mood – water plunges and rests, burbles and whispers, rolls and rises, rueda y sube. Marvelous. Lewis, J. Patrick; illus. Gary Kelley. Harlem Hellfighters. Mankato, MN: Creative Editions, 2014. This. This is a book. One of the NYT Best Illustrated Children’s Books of 2014, author Lewis served as the Children’s Poet Laureate of the United States from 2011 to 2013. The Harlem Hellfighters were the all Black infantry regiment known as the 369th who were a part of the more than 350,000 black American soldiers who fought for the United States before they were allowed to vote or even drink the same water as white Americans. While the black soldiers fought abroad, their black countrymen were getting lynched. When the Hellfighters came home at war’s end and marched in music and celebration with their band, their leader Big Jim was killed for being black, sliced in the throat by a man who was white. Lewis’s free verse and Kelley’s pastels work in jarring tandem, reminding us, in the midst of the centennial of WWI, to think of war and of country and of what, exactly, our nation is made. This. This is a book. Pinkney, Andrea Davis; illus. Shane Evans. The Red Pencil. NY & Boston: Little, Brown and Company, 2014. Amira, finally, is twelve. “There’s a bad part about turning twelve. In the eyes of my family, I’m nearly a grown-up. This means I must work even harder at farm chores.” But even this would be fine, if her farm wasn’t in South Darfur, Africa, and if her country wasn’t at war. Working is much better than war, even a twelve year old knows, but war has other considerations. When the fighting hits her village, Amira and the rest of the survivors forget about working farms that aren’t there anymore and start walking, joining the long trail of refugees heading for camp. Once arrived, Amira finds pencil and paper and works toward finding her voice. And with the help of Old Anwar, she heads toward finding a new home.